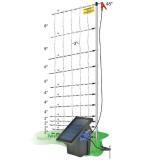 A prefabricated, portable electric fence that has 12 horizontal strands (11 conductive), is 48" tall installed and has string verticals every 3". Built-in line posts are spaced every 10'. 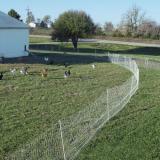 Keeps in chickens, ducks, geese and other poultry while keeping their ground-based predators out. Recommended for active, flighty birds. 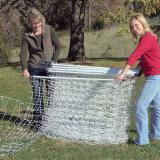 The taller 48" net is more likely to discourage large predators such as coyotes and dogs. 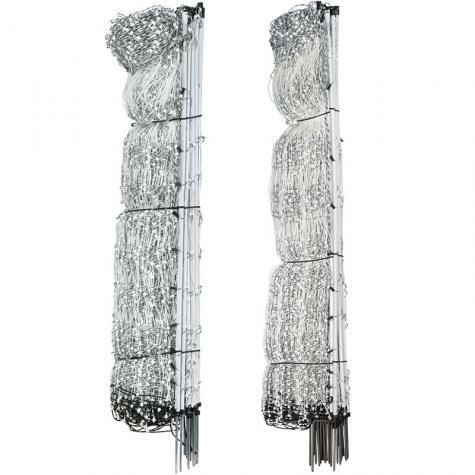 Arrives to your door as a preassembled fence. One roll (164 ft) weighs only 24 lbs. 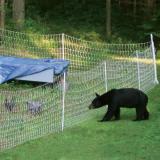 You will need a fence energizer to electrify the net. 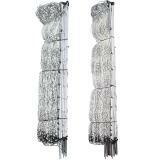 Number of reviews: 112 customers reviewed this product. Recommended: 106 out of 112 said they would recommend this product to a friend. 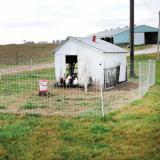 With its many horizontal and vertical lines, 48" PoultryNet can be a little heavy to move. 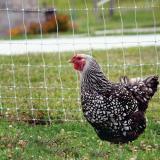 But, it’s better suited for flightier chickens than 42" net. 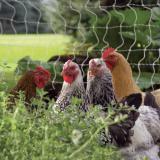 For some, it sags too much between the posts so we also have PoultryNet Plus. 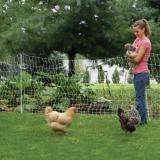 If you don’t plan to move your birds often, look to PermaNet Plus instead. 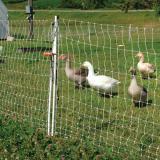 Heavy duty stakes hold the fence up without sags. Did not have to adjust it once during the season! 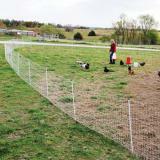 Awesome fence and very easy for one person who is 76 years old to put up! 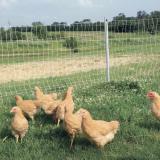 I purchased another roll [of Poultry Net 12/48/3 Double Spike] to add to my existing fence I bought last year. 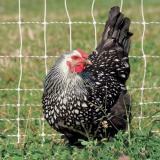 This fence is perfect for my pasture raised chickens! Even at 68 I am able to move the netting by myself to mow or reconfigure my lot shapes. 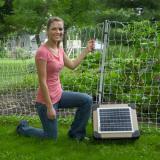 Also really like my solar fence charger! 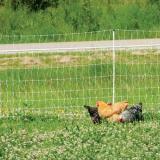 This fence is a godsend. Easy to assemble. 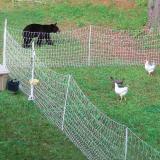 I feel so safe now with my chickens. I don't have to worry about predators or them getting loose anymore. It took me and my husband less than 10 minutes to put up.